Mean Green Trimming Machine DP20GT - ON SALE! - FREE Shipping! Mean Green Trimming Machine DP20GT 20" Diamond Plate Commercial Dry Trimmer features the digital touch screen pro timer with 3-speeds; forward and reverse. With its all metal chassis and larger motor, this machine is designed for the commercial grower. It is the industry top performer with 4-7 units per hour. Includes drawer with pollen screen. Clean the trimmer half as much with reversable motor. This automatic dry trim machine can be run on the daily. The Mean Green Trimmers come in three different types; the lightweight iridescent acrylic (IR), the more industrial diamond plated (DP), or a hybrid of the two materials (HY). 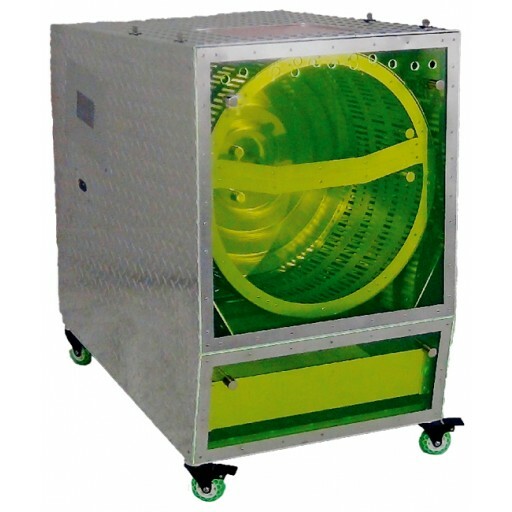 All metal chassis and larger motor, this machine is designed for the commercial grower. It is the industries top performer with 4-7 units per hour. Clean the trimmer half as much with reversable motor. Includes drawer with pollen screen. No Set Up Required, Out Of The Box Their Ready To Trim.